- The CCD does very diverse work. Who the CCD’s audience? Who do you try to engage with in the city? Our audience is mainly young people who use technology for creative purposes and needs, to improve their skills on the languages they use to create their technical abilities and their need to get in touch with peers in a physical space. Our programme chiefly supports the production and dissemination of a broad range of work executed by producers of digital culture who are not regarded institutionally as artists: programmers, creators, designers, producers of authored videogames, writers of poetry and expanded literature, event organizers and narrators who work with data, DJs, VJs, entrepreneurs of publishing and record companies and developers of cultural applications, among others. We are also very active in engaging communities of young people living in marginal situations like rehab centres, jail, or street children shelters. We also provide literacy open sessions for a general audience which is particularly attended by senior citizens. - Where does CCD sit within the digital community of Mexico City? Our recent opening has made it possible to open new institutional spaces which foster the critical and creative adoption of technology, based on the progress of the new forms of cultural production that spring from our daily relationship with the digital media. At CCD, we attempt to replicate a network logic in which the production and exhibition of culture is not one-way – that is, culture is not taken to the other; rather, culture is made with the other; a space where we recognize each other as consumers and producers simultaneously. As a young institution, we began by accepting that only few young Mexicans are populating the Internet with content that reflects the wealth, originality and prevalence of our culture. We do not specialize in artistic production/exhibiting as the Multimedia Centre or the Laboratorio Arte Alameda do, but on the popular expressions of creative digital production of a wider range of disciplines like design, popular music, gaming, coding, etc. - What is the structure of CCD, how do you support yourself? Information becomes valuable when it is used. We thus boost the creation of value of the investment already made in information resources, infrastructure and related technology. The idea is for young people to be made aware of the direct or indirect economic value generated by their production of information and action in digital spaces. For this purpose we create healthy, interactive and useful digital environments that provide the community with the ability to further their individual skills through collective development. As we have the possibility of teaching workshops at no cost, we establish a correspondence programme with our students, so that in return for free courses or laboratories they support vulnerable communities in our teaching programmes by giving workshops on literacy or providing other skills the centre needs such as translation, transcription of interviews or monitoring at special events. By establishing models of correspondence, we cultivate the sharing culture through a scheme of economic exchange between the institution and its community of students whose currency is knowledge. We'll work on reinforcing or program and focus on growing as a creative tech lab for cultural programmes. We'll also concentrate in two main topics: Big Data as a prime source for cultural and artistic production, and a more active implementation for teaching coding to children and young people. 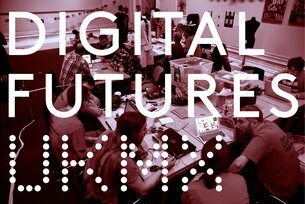 Centro de Cultura Digital was the host of the 48 hour prototyping marathon at Digital Futures UKMX - part of the UKMX2015, a year-long celebration of cultural, educational and business exchange between our two nations.